But we went out from Pilippi after the days of the Festival of Matzot. D. Thomas Lancaster, in his Torah Club Vol. 6 commentary on Acts 20-21:14 states that Paul and his party had been trying to make it to Jerusalem for Passover, but various difficulties interrupted their trip. Paul and the delegates immediately scuttled their plans. They did not dare board any vessel departing from Cenchrea together. They gave up hope of arriving in Jerusalem for the Passover. It was too dangerous. But apparently, even in the days of the Second Temple, Jews in the diaspora commemorated the Passover in some fashion without traveling to Jerusalem to offer the sacrifice according to the Torah of Moses. So where was Paul for Passover that year? Paul, Timothy, and Luke made their way backwards into Macedonia. They visited Berea and came to Thessalonica by Purim. They arrived in Philippi on (sic) time for Passover. Paul decided to spend Passover with the believers of Philippi. The Philippians had far fewer Jews in their community than Gentiles. There simply were not many Jews in Philippi, so Paul decided to use the occasion of the feast to teach the Philippians the observances of Passover. He could teach them how to conduct a Seder according to apostolic custom in remembrance of the Master. I’m not quite sure how Lancaster draws these conclusions, but it makes a wonderful picture of the Jewish apostle to the Gentiles teaching them a precious gift from the Master. It is unlikely that what we think of today as “taking communion” actually existed as a Christian practice in the days of Paul. It is far more likely that Paul and other apostles to the Gentiles, taught the believing God-fearing people of the nations of the Passover and the covenant of the Master that is commemorated in his body and blood on Pesach. We see in Paul’s first letter to the church at Corinth, that they also knew and understood the Passover language and symbolism, supporting the idea that at some point, it was relatively common for Jewish and Gentile believers to observe Passover in the diaspora together. One can imagine the disciples in Philippi pressed in tightly around the triklinium table of Lydia the purple dealer. 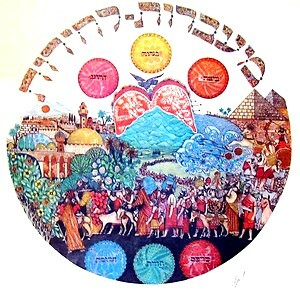 Over the seven days of Passover, they celebrated the resurrection of the Master together and began to count the days of the Omer leading to Shavuot. A few days ago, I wrote about my personal trepidation regarding the approach of Passover and the anticipation of leading a Seder with my family. I’m proceeding a little more optimistically, especially after discovering the sudden appearance of boxes of matzah in the kitchen pantry. But it’s the renewed realization of Paul and his Passover with the Gentiles in Philippi that reminds me that a Christian commemorating the Pesach isn’t just a “nice custom” for us, it’s a responsibility. But you have an opportunity for a fuller appreciation of it, for its additional implications for those who remember Rav Yeshua as reflected in its symbolisms. You may indeed identify with those few Egyptians who were willing to risk censure from their own people and join with the Jews who were eating lamb and matzah, and painting blood on doorposts, in order to flee with them in a mixed multitude. You may savor the metaphor of fleeing likewise from sin, having attached yourself to follow Rav Yeshua as an exemplar of Israel. If you choose not to remain in the Israeli camp throughout 40 years of desert wandering, you may settle somewhere along the way for a separate existence that nonetheless eschews idolatry and respects Torah values. I don’t really know if it was possible in that time to be intermarried, remain among Jews, and yet remain distinct by not becoming absorbed into the Jewish commonwealth. Ignoring Torah instructions in that era as some Jews did was a recipe for being destroyed in some quite unpleasant fashion. Thankfully today a non-Jew among Jews isn’t under quite the same pressure. I have desired to visit Jerusalem and particularly to pray at the Kotel during my lifetime. If God is gracious and it is within His desire, then this will occur. If not, then one day in the world to come, I will offer a sacrifice at the Temple and eat at the feast of Abraham, Isaac, and Jacob in the presence of the King. 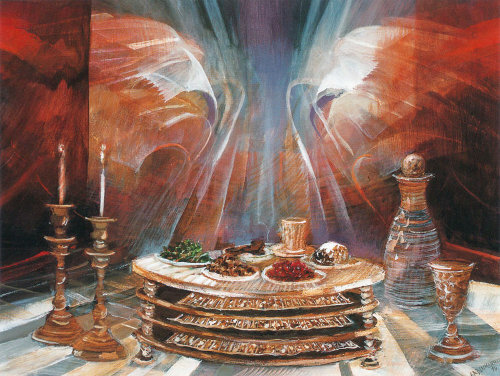 May this Pesach meal be in honor of my Master and may I give thanks that because he gave himself, his body, his blood, his suffering, that I can turn away from sin and turn to God as a partaker of salvation and redemption, and call myself a son of the Most High. Thanks, marko. Same to you. It is my sincere hope that you have a Blessed and Joyous feast this Pesach, James. I hope that this week you may be freed again, and that you will find yourself in the Peace of G-d, which transcends all understanding. My love to you, in Yeshua. Blessings to you and your’s, Nate. Amen and amen! I hope you get to go someday to the Holy Land … you’d be so blessed! Thanks, Dan. Same to you.